Invest 90-L Located Over The Southwestern Caribbean: Satellite imagery and weather analysis indicates that an area of low pressure has formed over the southwestern Caribbean. This low pressure system is now designated Invest 90-L by the National Hurricane Center. Invest 90-L is producing shower and thunderstorm activity which seems to have increased some today. The environmental conditions across not only the southwestern Caribbean but also across the western and northwestern Caribbean are favorable for development and all signs are pointing towards that Invest 90-L will strengthen into Tropical Storm Nate by the end of this week and potentially Hurricane Nate as it heads for the northern US Gulf Coast this weekend into early next week. The latest model guidance have trended considerably stronger with their forecasts of Invest 90-L with the latest GFS model forecasting it to become a tropical storm in the northwestern Caribbean on Friday and a hurricane as it moves from south to north across the Gulf of Mexico on Saturday with a landfall in southeastern Louisiana on Sunday morning as a hurricane. The European model guidance has also trended stronger and now forecasts Invest 90-L to enter the northwestern Caribbean as a tropical storm on Friday and become a hurricane in the Gulf of Mexico this weekend. Ultimately, the European model forecasts this system to make landfall as a hurricane near Panama City, Florida on Sunday evening. There is a pretty large spread in the European ensemble guidance members anywhere from a landfall in southeastern Louisiana to landfalls along the west coast of Florida. It should be noted that there is a cluster of ensemble members that show a landfall on the Florida Panhandle on Sunday night/Monday. 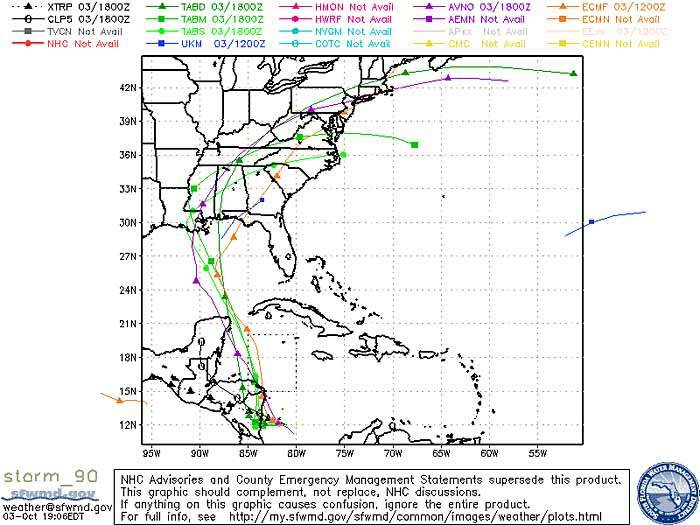 Here Are My Thoughts: I think that the disturbance (Invest 90-L) is well on its way to becoming our next named storm. I think that there is at least a 80 percent chance that Invest 90-L will be Tropical Storm Nate by the time it reaches the northwestern Caribbean near the Yucatan Channel on Friday. The environmental conditions this weekend look favorable for strengthening and this is very worrisome because we could have an intensifying tropical storm or hurricane headed for the northern US Gulf Coast between southeastern Louisiana and the Florida Panhandle by late Sunday into Monday. This means that it is time for everyone from southeastern Louisiana to the Florida Panhandle to really pay attention to the forecast of this system. There is the very real potential for a hurricane landfall by late Sunday or Monday anywhere between New Orleans and Tallahassee. A tropical wave located over the southwestern Caribbean Sea became much better organized Tuesday. An area of showers and thunderstorms associated with this tropical wave east of Nicaragua and Costa Rica is showing signs of development. 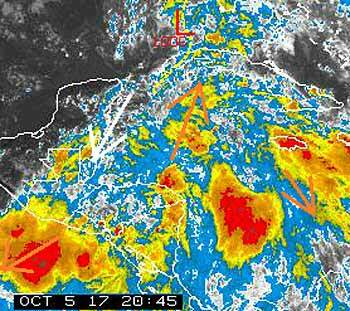 This area of convection will move very near the Nicaragua coast through Wednesday. It will then move over the open waters of the northwestern Caribbean later this week. 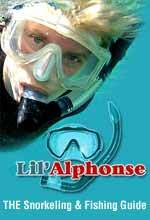 Extremely warm water is present in the northwestern Caribbean. There will be some shear, but tropical development is likely by Friday, if not sooner. Heavy rain and flooding is likely in parts of Central America over the next few days as this system moves north. Strong winds and heavy rain is possible in western Cuba and the Yucatan Peninsula late this week. This feature will then move into the Gulf of Mexico this weekend. Indications are that it will continue to strengthen as a tropical storm or perhaps even a hurricane. 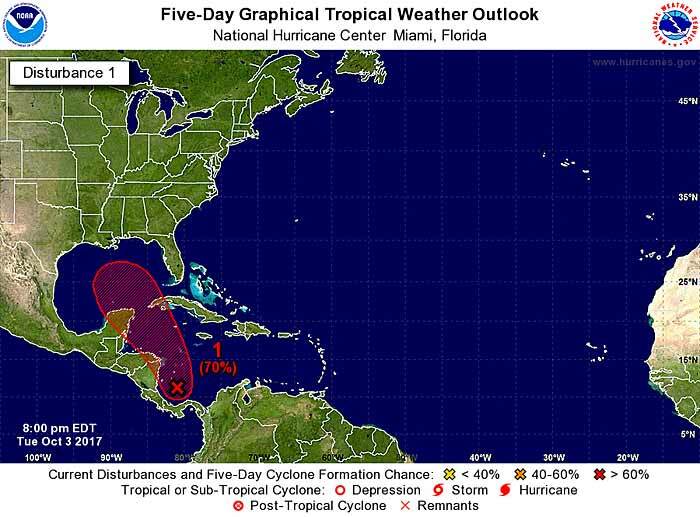 AccuWeather meteorologists are honing in on an area for rapid tropical development in the short term. A tropical disturbance was hovering just east of Nicaragua on Wednesday morning and may evolve into a tropical depression and storm at any time as it wanders toward the north-northwest and near the Yucatan Peninsula into Friday. 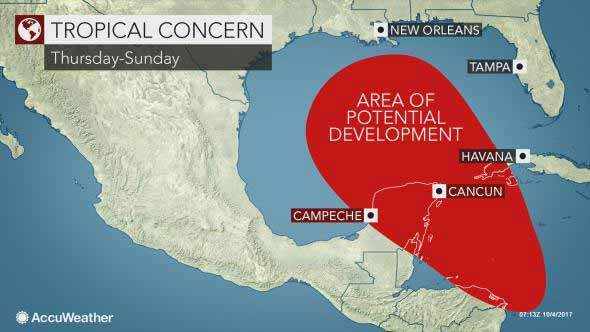 "Any feature that develops in this area is likely to drift in a general northward direction and over the Gulf of Mexico," according to AccuWeather Hurricane Expert Dan Kottlowski. 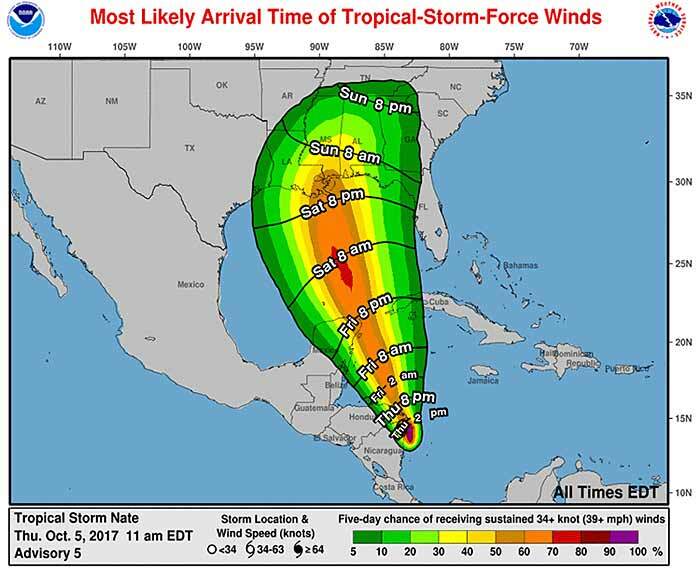 "Should the system develop just east or southeast of the Yucatan Peninsula, where waters are the warmest, we could quickly have a powerful hurricane on our hands," Kottlowski said. 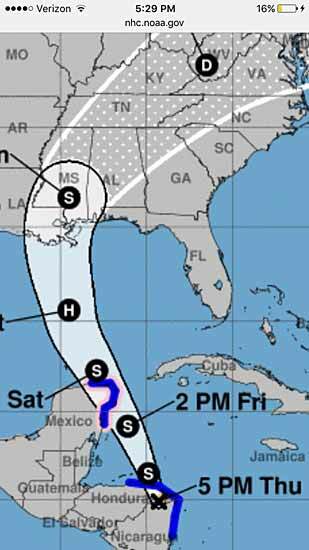 "There is the potential for a tropical storm or hurricane to make landfall along the Gulf coast from southeastern Louisiana to the Florida Panhandle this weekend." 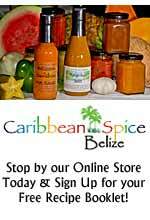 People from Belize, the Cayman Islands, southeastern Mexico and western Cuba to the United States' northern and eastern Gulf Coast should keep up to date on the situation. Development may at occur any time through Saturday and could do so and strengthen rapidly. Showers and thunderstorms associated with an area of low pressure located over the southwestern Caribbean Sea have become better organized since yesterday. This system is expected to become a tropical depression later today while it moves northwestward toward the coast of Nicaragua. The low should move slowly northwestward across or near the eastern portions of Nicaragua and Honduras on Thursday, move into the northwestern Caribbean Sea by Friday, and emerge over the southern Gulf of Mexico by Saturday. Interests in Nicaragua, Honduras, the Yucatan Peninsula and western Cuba should monitor the progress of this system as watches or warnings could be issued later today. An Air Force Reserve reconnaissance aircraft is scheduled to investigate the disturbance this afternoon. Regardless of development, this system will produce heavy rains over portions of Central America during the next few days, likely causing flash floods and mudslides. Invest 90-L Located Over The Southwestern Caribbean: Invest 90-L, which is located over the southwestern Caribbean, is gradually organizing and it looks very likely that it will become a tropical depression and then Tropical Storm Nate within the next 24 hours or so. This increase in organization includes deep thunderstorm activity firing right over the low pressure center and falling barometric pressures. The environmental conditions around Invest 90-L are quite favorable for development and intensification. These favorable to very favorable environmental conditions include extremely warm ocean water temperatures, no dry air around and very low wind shear values. This means that Invest 90-L will likely have little or no problems with intensification over the next few days. Over the next couple of days or so, Invest 90-L is likely to move on a northwesterly to north-northwesterly track bringing it across eastern Nicaragua and eastern Honduras as a intensifying tropical storm during Thursday into Friday. From there, Invest 90-L will reach the northwestern Caribbean during the day on Friday and has the potential to move right over the northeastern Yucatan Peninsula around Cancun and Cozumel on Friday as a hurricane. Everyone across the northeastern Yucatan Peninsula, including Cancun and Cozumel should prepare for hurricane conditions which are expected on Friday. If it maintains its projected path based on that forecast it is expected to become a Tropical Storm and by Friday, 6th October 2017 it is expected to be east of Belize, or directly in front of us. 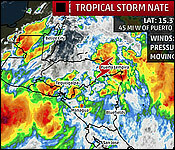 Tonight's the nation's eye are on Tropical Depression 16, which is hovering off the coast of Nicaragua. According to the latest report from the National Hurricane center in Miami, the system has winds of 35 miles an hour, and is presently 60 miles west of San Andres Island. 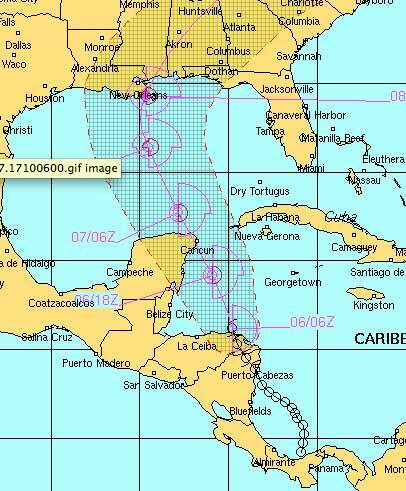 A Tropical Storm Warning is in effect for Sandy Bay Sirpi Nicaragua to Punta Castilla Honduras. 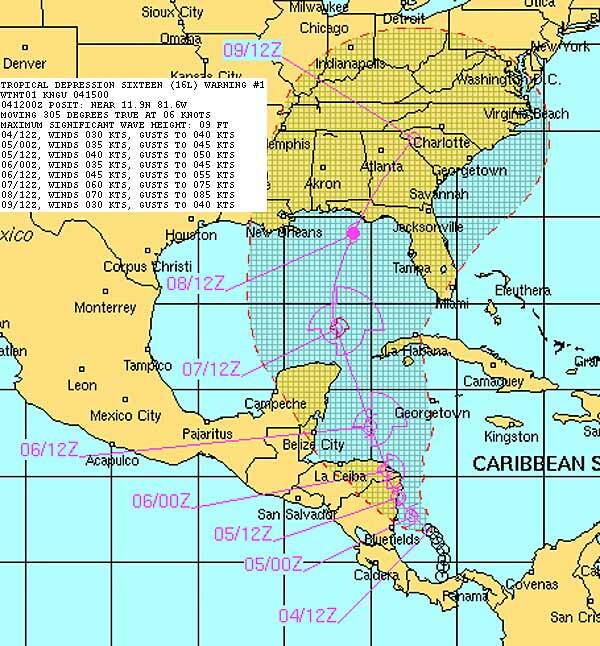 The system is moving northwest which would push it way from Belize, but NEMO says, you have to be prepared for anything. 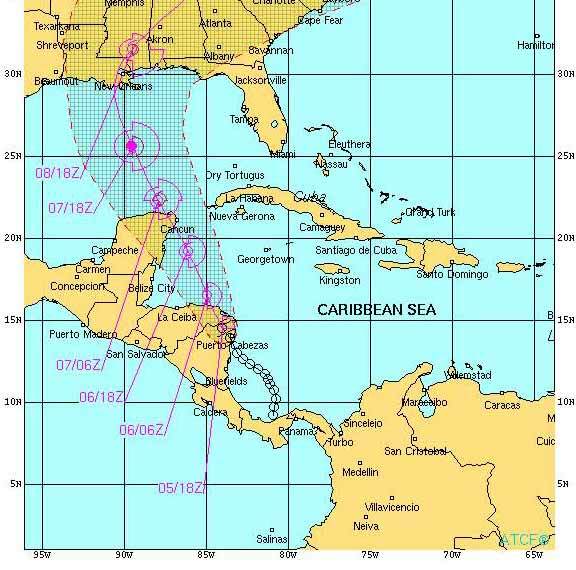 NEMO says If it maintains its projected path it is expected to become a Tropical Storm and by Friday, 6th October 2017 it is expected to be east of Belize, or directly in front of us. 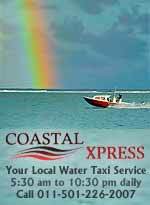 An advisory adds, "The public is hereby advised to make preparations to protect life and property. 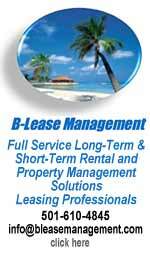 If you are at risk to bad weather and flooding start discussing arrangements to move to higher grounds." It also says, "Do not venture out to sea after Friday, 6th October 2017." Nate is expected to move northwesterly into the northwestern Caribbean tonight into Friday and is likely to strengthen due to somewhat favorable environmental conditions and extremely warm ocean water temperatures. By Friday afternoon and Friday night, Nate is forecast to impact the northeastern Yucatan Peninsula, including Cancun and Cozumel as possibly a hurricane. Everyone across the northeastern Yucatan Peninsula, including Cancun and Cozumel should prepare for hurricane conditions which are expected on Friday afternoon and Friday night. Once Nate finishes its traverse of northeastern Honduras on Thursday evening and emerges into the Western Caribbean, the storm will be in a very favorable environment for intensification. The 12Z Thursday run of the SHIPS model predicted that wind shear would be low to moderate, 5 – 15 knots, through Saturday. SSTs will be a very warm 30°C (86°F), and Nate will have an unusually moist atmosphere, with a mid-level relative humidity of 80 – 85%. Nate will be passing over an area of very high ocean heat content (OHC) in the Western Caribbean, with very warm waters that extend to great depth. Since Nate is unlikely to emerge from Honduras as a well-organized system, it will probably take the storm about 12 hours to get organized and take full advantage of these favorable conditions. The Thursday morning runs of our top five intensity models showed modest intensification of Nate on Thursday evening through Friday evening, with none of the models predicting that Nate would be a hurricane when it makes its closest approach to Cozumel and the northeastern tip of Mexico’s Yucatan Peninsula on Friday night. However, the 12Z Thursday SHIPS model Rapid Intensification Index gave Nate a 40% chance of being a Category 1 hurricane with 75 mph winds by 8 am Friday, 12 hours before it will make its closest pass to the Cozumel/Cancun area. The way this hurricane season has gone, it is safer to predict intensification at the upper end of what our intensity models are predicting, and residents and visitors in Cozumel/Cancun should expect that Nate will be a Category 1 hurricane Friday evening when it makes its closest pass. The 11 am Thursday NHC forecast for the probability of tropical-storm-force winds for the five days ending on Tuesday, October 10, 2017. New Orleans was given about a 50% chance of tropical storm-force winds of 39+ mph, with those winds most likely to arrive on Saturday night. 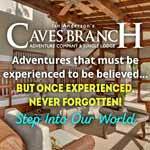 Cancun and Cozumel were also given about a 50% chance of seeing tropical storm-force winds, with the onset occurring late Friday afternoon. Image credit: NOAA/NWS/NHC. Despite what they are saying about TS NATE I am not seeing this as any Tropical Storm. Just a lot of ITCZ activity. I might be wrong, but I think they are being over estimating what is going on. 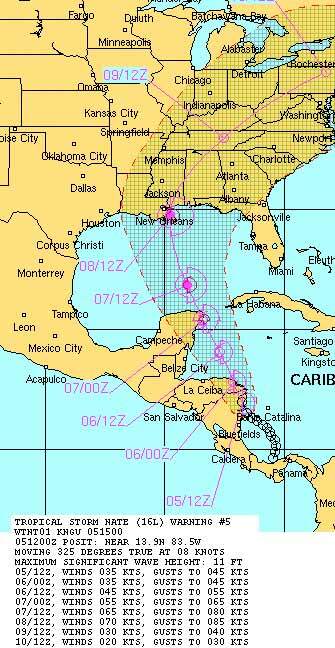 But it could develop going up across the Gulf, after passing Belize, during tomorrow. But we are generally in a fair bit of rain at present. Although this rain we are seeing, is as a result of the Air and cloud coming down from the NE over Florida, clashing with high level cloud. 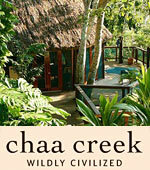 Nothing to do with any approaching Tropical Storm. I am not seeing any significant rotation. Drivers are reminded to drive with extreme caution, when driving in wet conditions, reduce your speed, put on your low beam, and hazard lights. 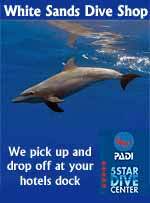 Do not drive through flood waters. Last night we told you about TD16, well tonight it's Tropical Storm Nate, and so far it's already responsible for 22 deaths in Nicaragua and Costa Rica. Tonight, Tropical Storm Nate is about 450 miles southeast of Belize with winds of 40 miles per hour, and dropping copious amounts of rain. 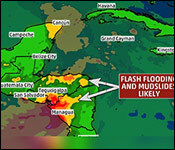 NEMO says the main threat to Belize is expected to be mostly thunderstorms and heavy rain which are likely to cause dangerous flash floods and localized flooding. 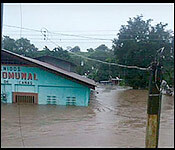 As much as 6 inches or higher rainfall is expected. 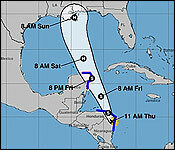 NEMO further advises that "the current track keeps the centre of the storm in the warm waters off the coast of Belize. 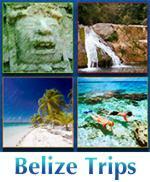 The stronger winds are expected to be east of Belize, over the sea. 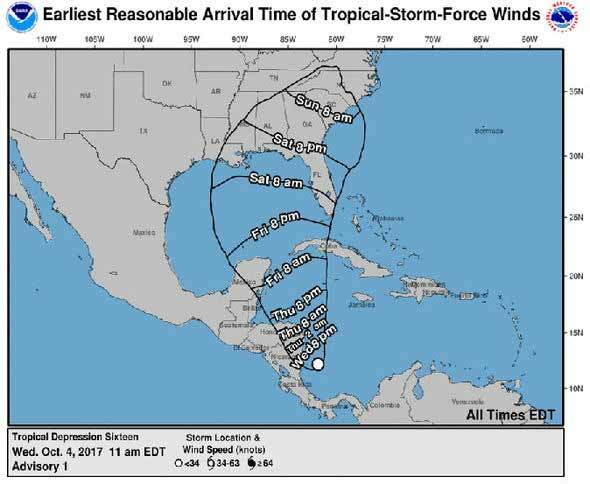 By tomorrow Nate is expected to be directly in front of Belize. It is likely that a Tropical Storm Watch will be issued. Nate is forecasted to reach the north-eastern Yucatan Peninsula and head into the Gulf of Mexico by Friday night or early Saturday. Due to the size of the system the country could continue to experience rainfall even after the storm gets into the Gulf of Mexico." So, if you live in low-lying areas NEMO advises you to move to higher grounds. They add, that it is not advised to venture out to sea tomorrow - and say that Fishers and people on the Cayes are hereby strongly urged to monitor Tropical Storm Nate and to take the necessary actions to preserve life and property. 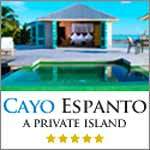 In the Cayo district the Succotz Ferry is closed, and in the Stann Creek district, the Coastal road is closed due to flooding. 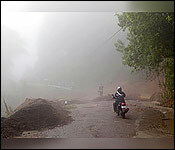 The U.S. National Hurricane Center says the storm could cause dangerous flooding by dumping as much as 15 to 20 inches of rain as it moved over Honduras. 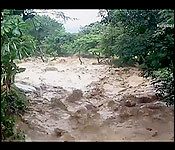 The Miami Herald reports that in Nicaragua, Nate's arrival followed two weeks of near-constant rain that had left the ground saturated and rivers swollen. Nicaragua's vice president said that at least 15 people had died in that country due to the storm, while Costa Rica's Judicial Investigation Organism blamed seven deaths in that country on the storm and said 15 people were missing. 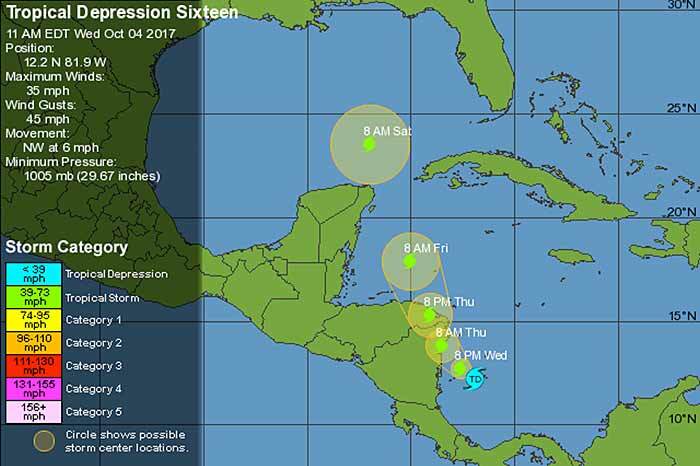 For more information on Tropical Storm Nate, check the Daily Tropical Report, click here. TS NATE appears to have passed Belize and on its way up towards Cancun for this evening or night, where it will have more significance than it was to Belize. Also now it does look as if there is some significant rotation and having been over open sea, has probably increased in strength, so it is now probably a real Tropical Storm, now listed at over 50 mph, and will probably go very close to, or even over Cancun. We will continue to get air and cloud from the NW for another day or so, but otherwise little after effect.